If I had a Franken for each time someone asked me how to set s.products and List Vars using DTM, … but I don’t. And the question is valid. And it comes up a lot, so let me write down how it is done. Note: my friend Pedro was faster this time, see his post on products and the W3C data layer. But since I had written most of this post, and since more is always better, I decided to post this anyway. On my site, I want to track the products that people look at, put into their basket, and buy. How do I populate s.products using DTM? I have teasers on my homepage, I want to track impressions and click-through rates for them. List Vars seem like the answer, but how do I set them using DTM? Neither s.products, nor s.list1 — s.list3 are available in the UI in DTM. There is simply no place where you could assign a value to them! Thinking back to “pre-Tag Management” days, … no, sorry, that sounds wrong. The difference now is that when you use DTM, other “variables” can directly be assigned in the UI, usually using Data Elements. But the non-visual way of assigning values still exists, albeit slightly hidden. 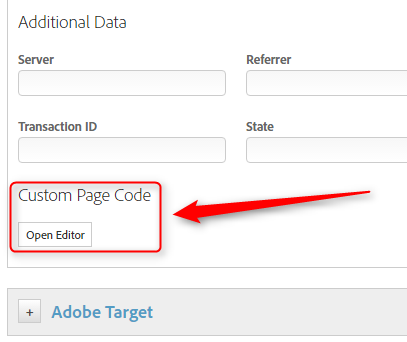 Have you ever noticed the little “Open Editor” button at the bottom of the “Adobe Analytics” section in your rules? Let me walk you through an example: setting s.products on cart add. As a pre-requisite, I shall presume that your site is built with a CEDDL-compatible data layer, which means we can see product information in digitalData.product, digitalData.cart, or digitalData.transaction. Nice. There are two different ways of implementing cart adds: you can take the visitor to the cart when they add something, or you can just make a subtle change to the cart symbol on the page to show that the add was successful. If you use the first approach, you’ll likely track the cart add on the cart page itself, but if you use the second, you’ll use an Event-based or a Direct Call Rule, because you track the interaction. We’ll use an EBR. After you have configured the EBR according to your needs (set conditions, select “s.tl” for tracking, adding eVars and events), you can click the “Open Editor” icon at the bottom of the Analytics section to open up a code editor. This is a cart add, so we don’t need quantities or prices. To DE Or Not To DE? Since I mentioned Data Elements: should we use them? I disagree, out of a non-specific feeling of unease. Having a Data Element (itself containing custom code for the loop, presumably) means that if DTM ever introduces an option to set s.products or s.listX in the UI, I can easily switch. Nicely encapsulated, and, more importantly, ready for the big day when assigning s.products in the DTM UI will be possible. Great post! I’ve been trying to collect/document examples at http://www.digitaldatatactics.com/examples/products.html. So thanks for showing the DE-ified method. Maybe my solution in registering the list-variable with the s.linkTrackVars and having an s-object in the code might help some others. Do you know, why I was not able to just add the following? I have no idea why this did not work. Thanks a lot non the less, as this answered a current question of mine and led me to a working solution. There’s code in DTM that explicitly checks for “products” and “events” in rules that fire s.tl(), then adapts trackLinkVars and trackLinkEvents accordingly. But there is no such code for listX. Your code is what I’d recommend as a workaround. which seems to work fine. Is there anything I should watch for? Whether you can directly access “s” or not depends on how Analytics has been added in DTM. If you use the standard approach of letting DTM manage the Analytics library, DTM will not create an “s” object outside its own scope, which means you will have to retrieve it using the getS() method. It seems that in your case, the Analytics library is managed either outside DTM or using the editor window in DTM (an approach Jenn Kunz uses). In that case, you’re fine.